I love interactive interior design sites. Quizzes that pinpoint style, tools that help pick out colors, galleries that suggest furniture... I just can't resist. 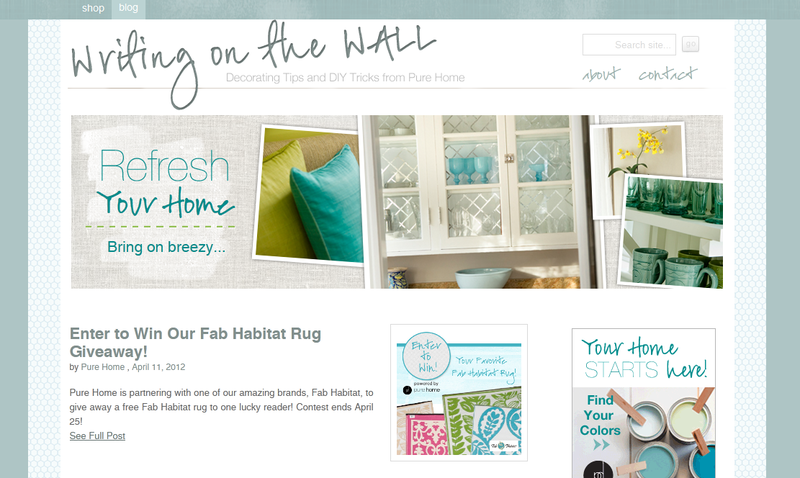 So naturally, when I heard about the new website Pure Home... I just had to give it a try. 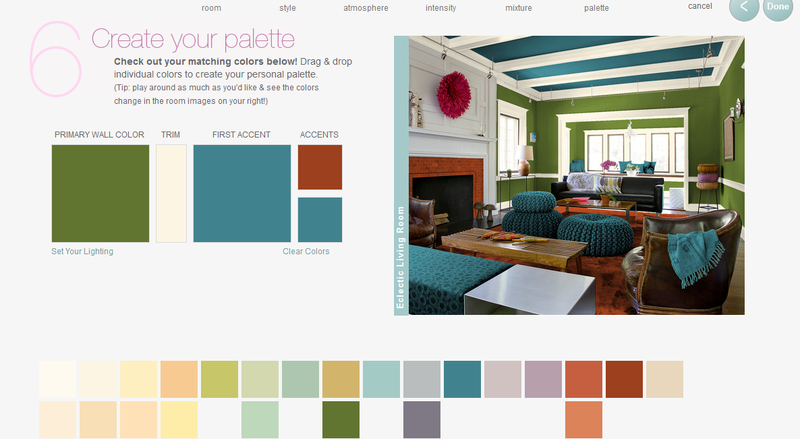 Pure Home guides users through the decorating process by starting at square one: color. Now that's a philosophy I can get on board with. Then you get to pick up to 5 words to further describe your style. So what did I want to go into my Eclectic? Well, a little shabby chic. A touch of whimsical. Some unpredictability. Lots of artsy. And a bit of mixing up. You also get to pick what kind of room. For my first go, I chose a living room. After going through the style selection process and a few questions about what kind of colors I gravitate towards, I was given an eclectic living room and color palette specially selected to suit my tastes. Then comes the real fun part---playing with colors! I "painted" the walls of the room a lush green that reminds me of summer's rolling hills. I got bold and painted the ceiling a rich turquoise tone. Crisp white trim brightens up the space. And I threw in some brick red accents to warm things up. What a gorgeous space, right?! 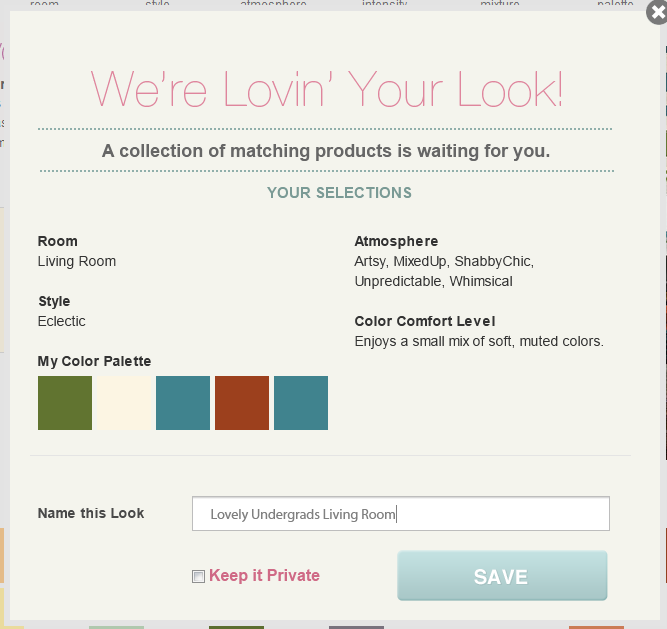 Then you can save your space so that you can access your style, color palette, atmosphere, and comfort level info again and again. You can find products that match the style of your room. Use the products to create a moodboard or purchase them right away. (Free shipping on all orders!) I did a little product-browsing for the lovely mint-green office space I created, integrating a white cabinet, floral picture frames, candle, and wicker baskets. (You can also order paint samples, which I think is pretty nifty.) 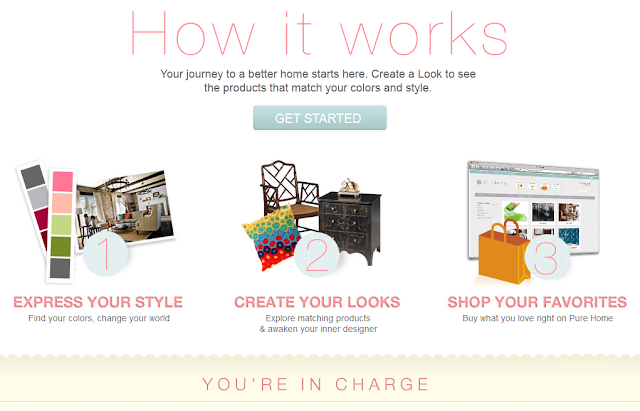 Plus, there's a little button you can add to your browser to clip images, furniture, accessories, etc. from the web to add to your collections. I predict I'll be spending some serious time on Pure Home's blog Writing on the Wall.